World Breastfeeding week will be celebrated in 2015 from August 1st - 7th. 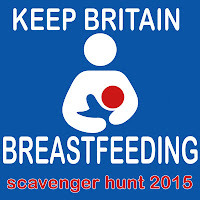 The goal of the Keep Britain Breastfeeding Scavenger Hunt 2015 is to add a little bit of fun, raise awareness of breastfeeding and promote a positive message. Many women do not reach their breastfeeding goals, stopping much earlier than they intended to. During the World Breastfeeding Week bloggers and companies that support breastfeeding and have something to say about it will be sharing their views, experiences and knowledge with you so that you can make an informed choice about your very own breastfeeding journey and perhaps give you the confidence and information you need to achieve yours and your baby's breastfeeding goals. Each day our bloggers will be writing articles and posts around around a different theme. You will hear from a large collection of Mums and family members as well as organizations andcompanies sharing their experiences around these seven themes, and we ask that you take a few minutes each day to read the articles and share them with your friends so that you can learn something new, share a top tip by commenting on the articles and be entered to win the amazing Grand Prize! All you need to do is subscribe to this blog so that you can receive updates about the Hunt and information on where to find the newest articles and posts. As soon as bloggers and companies get onboard there information will be published on this site so that you can see who's taking part and go along to read their past posts and learn about how they breastfed or support breastfeeding through products or charitable work. Once the Hunt begins at 8:00am on Saturday August 1st, 2015 you will be able to visit the bloggers, companies and organizations websites to hunt for their breastfeeding articles which will include a Keep Britain Breastfeeding Scavenger Hunt 2015 logo. Once you have read the article and found the logo you can enter the competition by using the Rafflecopter widget which will ask you to leave a comment about the article or answer a simple question about breastfeeding. You will also have additional chances to enter the competition by sharing the competition on facebook and twitter. Each time you comment about an article or share the competition you will receive points. Once you have accumulated 50 points you will be eligible to enter to win the Grand Prize. I do not have the ability to keep a running total of points for everyone but reading just ten articles should give you enough points to enter the Grand Prize competition. Don't worry if you don't have enough time to accumulate this many points as there will be smaller competitions to enter throughout the week and you may even find out about some amazing coupon codes and offers to use at some of the company websites - so stay tuned for more information. I love the new Emma-Jane 830 nursing vest because the material is super soft and I've been a lot colder since having Ellie. I was always super hot with William? I love the look of the Nursing Bra 431, very pretty! I don't actually have any emma jane bras but have heard they are very soft and comfortable. Bra #431 would actually fit me and looks like it's not cut up to my neck! I too am a keen mummy blogger! So keen to stay involved. I love the look of the Emma Jane nursing vest, looks comfy but cool enough to layer. I think we're all ready. Loads of lovely blogger and companies involved with a tonne of prizes up for grabs all week. Have a great Breastfeeding Week! I won in 2013, most amazing prize, it was Christmas everyday with the amount of deliveries I received, many of the items are still used to date. Another baby due in December, so fingers crossed I can win something nice or get some bargains. I feel like I have entered about 20 giveaways so many its fab, hope I have accumulated enough. I was a twin b/fer so less time than I wanted. I saw a tweet for a giveaway. I breastfed my daughter, now 24, and my neighbour has just brought her prem b/g twins home and is feeding them herself. Would love to win something for her. Don't imagine she has much time at the moment.